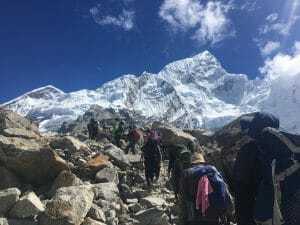 How to prepare for the Everest Base Camp Trek in Nepal. There are a few things to consider the two main things are acclimatization and how you should physically prepare. 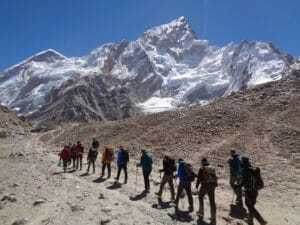 You should also check out our page with all you need to know about trekking to Everest Base Camp. 1). Being prepared for the Everest Base Camp Trek in Nepal. I have just returned from leading my 28th and 29th Everest Base Camp and Kala Phattar treks. I have been lucky enough to stand on the summit of Mt. Everest and climbed over 18,000 feet one hundred times. Ian Taylor Trekking have lead over 1,600 people to Everest and over the years we have adjusted our schedule to suit everybody. We have added an additional day in Namche Bazaar at Hotel Namche giving people the best accommodation, food, service and acclimatization available for the trek to Everest Base Camp. 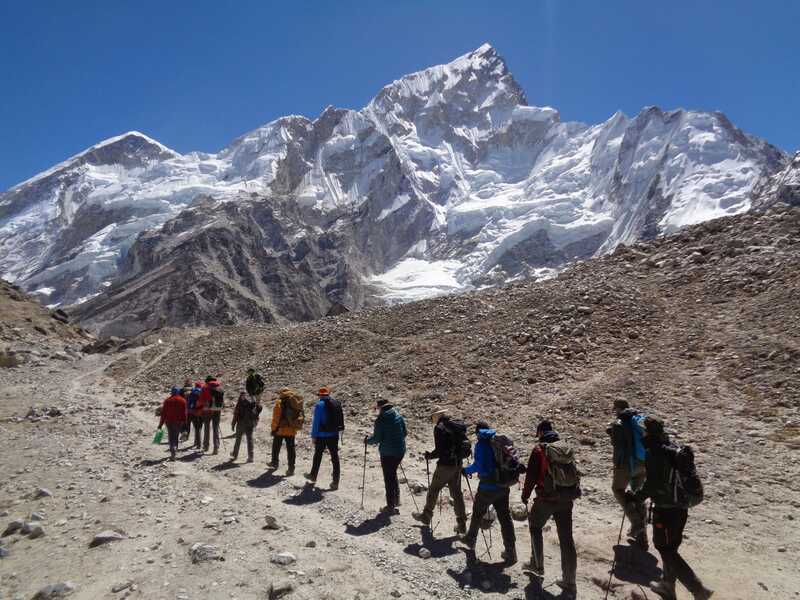 So we spend 3 nights at 11,500 feet (THE CRITICAL ACCLIMATIZATION ZONE) Not on our trips, but what we are seeing is more and more people not coming prepared for their trek to Everest Base Camp. This is an adventure trekking holiday at high altitude on rugged uneven terrain up and down hills all the time. There are no flat areas, so having the strength and conditioning is really really important. 2). What is happening on the Everest Base Camp trek. I am witnessing too many people putting their bodies under a lot of stress and pressure. There are far too many under prepared people on the trail to Everest these days. Way too many tourists making it more dangerous for everyone else. Most people have no idea of trail etiquette. I even feel bad for some of them. The pain and anguish I witnessed in so many faces is such a waste of their time. A lot of people never even made it past Dingbouche at 14,000 feet. There were so many people in all the wrong gear. Terrible back packs with no support, minimal hydration and no basic training in support of their adventure trip. I see this as disrespectful to fellow team members and local people. So many helicopter rescues are leading to higher premiums for insurance cover. I am also shocked that insurance companies are covering the people I am seeing on the trail. I am also seeing far more children, teenagers on the trail. Parents dragging up children who don’t really want to be there needs to stop. To top it all off I saw someone being pulled up Kala Phattar on the back of a horse and so many people going up and down on horses and helicopters that could not walk. It is not good for the Everest region, the people or the future of trekking in this amazing and special place. 3). What makes the Everest Base Camp Trek so special. Everest as a mountain and the mountain scenery in this part of the Himalaya’s is truly remarkable. The highest mountains in the world all on display. You can see Mt. Everest. Lhotse, Makalu and Cho Oyu. These are all in the top 6 highest mountains in the world. The Khumbu glacier, Pumori, Nuptse, Ama Dablam, Cholatse, Thamsurku. All awe inspiring mountains in their own way and in their own right. The hanging glaciers on view are nothing less than spectacular. The main reason we come back again and again is the Sherpa people, their culture and you need to come and experience these genuine people who serve you, help you and guide you through this very special experience. 4). Training and preparation is really important to enjoy the Everest Base Camp trek. I believe you need to come trained and prepared for the trek to Everest. If you are on one of our itineraries you will arrive in Everest Base Camp on day 9, 10 or 12 which is great for safety, success and your enjoyment. On the way down you will cover 13 miles per day back to back up and down hills on uneven terrain. This requires a good level of physical conditioning and not to be underestimated. We have helped so many people gather the information they need to make a safe and successful journey to Everest. We can help you, CONTACT US today and get signed up and started on your road to Mt. Everest. Read our TOP 10 TIPS for a successful trek to Everest. Read some REVIEWS from our trips and follow us on Facebook.